The first evidence of an organ in St. Wilhadi is from 1322 by a builder named Berthold. 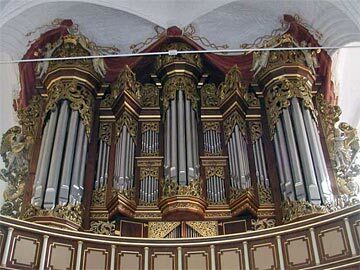 No further information is known until Berendt Huß built a new organ in 1673 after a devastating fire in 1659 in Stade. Three years later Huß died and was buried at St. Wilhadi. His nephew Arp Schnitger took over the project and completed the organ in 1678. The organ was damaged in the Danish bombing of 1712 and in 1713–1714 Schnitger returned to repair the organ. Unfortunately, this organ was short lived and was completely destroyed in 1724 when lightning hit the church tower. The destruction was so thorough that a chronicle reported “sodaß man das Zinn aus den Gräbern”—one would have to seek the tin in the graves. Erasmus Bielfeldt, builder in Stade, began a new organ in 1731 that was completed in 1736. Little was changed in the organ until 1894 when a swellbox was put around the Hinterwerk. As in many German organs, the tin façade pipes were taken for the war in 1917. As was the new custom in 1937, the Hinterwerk was moved to the gallery. The division was unenclosed until the early 1960s when a new Rückpositiv case was built. A complete restoration of the organ was completed in 1990 by Jürgen Ahrend of Loga-Leer to return the organ to the condition of 1736 from Bielfeldt.